On November 3, people around the world will stand together to tell the Canadian government and corporations to stop destroying our Great Northern Forest, the Boreal. Join the growing global movement to save the Boreal – mark your calendar and start organizing now! Greenpeace, Forest Ethics, the Rainforest Action Network, Natural Resource Defense Council and other groups working to save ancient forests are teaming up to hold the first ever International Day of Action for the Boreal Forest. November 3rd will be a powerful day of coordinated action with a common message and a common goal: to turn the world’s attention to the threats posed to this ancient forest and to demand that it be protected. As part of Save the Boreal Forest Day, activists across Canada and the United States will be planning events to hold corporations like Kimberly-Clark, Victoria’s Secret, and Weyerhaeuser accountable for their forest crimes. Demonstrations, banner hangs, street theater... you name it, forest activists will be doing it. Get creative and start thinking now about what you can do to get the word out and organize an event on November 3rd. What is the Boreal Forest? The Northern American Boreal forest comprises 25% of the world’s last remaining ancient forest. It is home to hundreds of species of animals including bear, wolf, moose, caribou, lynx, eagle, hawk, owl and nearly 50% of the 700 North American bird species that depend on this forest for nesting and breeding grounds. It is crucial as a carbon sink for battling global warming pollution. The Boreal is a land of myth and beauty-where wolves and caribou roam wild through a pristine landscape of lakes and forests under a sky painted with the great northern lights, and where communities still retain their connection to the land. It is the conservation opportunity of the century. 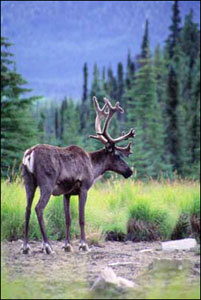 The Boreal Forest contains a rich cultural legacy and is home for indigenous peoples of Canada-First Nations and Metis. Almost 80 per cent of Canada’s more than 1million indigenous people live in more than 600 communities in Canada’s forest regions, and many depend on wilderness lands, waters, and wildlife for their livelihood. Their future is currently under threat due to a handful of U.S. based multinational corporations that are systematically destroying one of the most precious places on earth. Get involved, take action now to protect the Boreal Forest!